128 MB standard memory, USB port, duplex capability, 10/100BaseTX Ethernet, and Wireless Ethernet. Looking for IBM Infoprint 1826 Parts? InfoPrint Color 1826 multifunction printer (MFP) - an all-in-one MFP with color printing, scanning, and faxing capability. The 4989 InfoPrint Color 1826 MFP Model DN1 comes with 128 MB standard memory, 640 MB maximum memory, USB port, duplex capability, a 500 MHz processor, and 10/100BaseTX Ethernet. 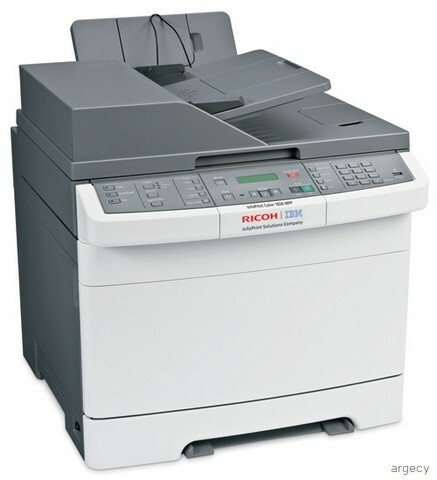 The 4989 InfoPrint Color 1826 MFP Model DW1 comes with 128 MB standard memory, 640 MB maximum memory, USB port, duplex capability, a 500 MHz processor, 10/100BaseTX Ethernet, and Wireless Ethernet. Note:(1) Exact print speeds vary depending on document complexity, system configuration, software applications, driver, and printer status. All models include one 250-sheet drawer, and a single sheet manual slot standard. One 650-sheet duo drawer is supported for a total input capacity of 901 sheets. This duo drawer has a 550-sheet draw and a 100-sheet multipurpose feeder (MPF). Output capacity for all models is 100 sheets. Duplex capability is standard on all models. All models have one slot for additional SDRAM memory. Memory options for the printer include 128 MB, 256 MB, and 512 MB memory DIMMs. All models have one slot for flash memory with a 64 MB flash memory option available. All models include 10/100BaseTX Ethernet as standard. Some models include wireless Ethernet as standard. The wireless models allow the printer to be connected directly to a wireless LAN. This supports the IEEE 802.11b, 802.11g, and 802.11n draft 2.0 standards. Draft 2.0 refers to the version of the not-yet-ratified IEEE 802.11n standard. The maximum monthly usage for the InfoPrint Color 1826 MFP is 55,000 impressions. InfoPrint Solutions Company does not recommend printing to the monthly maximum on a consistent basis. InfoPrint Color 1826 MFP has five Toner Darkness levels for color and monochrome. The default setting is 4. When printing in color, level 5 is equal to level 4. Refer to the table below. Note:These percentages are only approximate. Additional fonts can be downloaded to the printer RAM. PCL emulation supports both scalable and bitmapped downloadable fonts. PostScript emulation supports only downloadable scalable fonts. Included on the CD-ROM shipped with the printer are a variety of downloadable fonts for Hebrew and Arabic. Color is used as an enhancement for conveying information, as well as an additional method of distinguishing between buttons, controls, and latches. All products in this announcement are customer setup. Continuous Print Speeds (ppm simplex, spm duplex) are shown in the following table. For media sizes smaller than those listed below, the "narrow media" paper type should be selected. Throughput may be reduced for narrow media in some circumstances to protect the printer from thermal damage. Note:(1) When printing from tray 1 or the optional 650 Drawer: Simplex and Duplex; In the first print job after a POR or tray insertion, the first 4 pages print at "legal" speed. The remainder of the pages printed (until the next POR or tray insertion) print at the speeds shown. Note:(2) The first 15 narrow pages run at full rated engine speed; subsequent pages run at the speed shown. Note:(3) Paper labels supported for occasional use only. Note:(1) When printing from the multipurpose feeder: Simplex and Duplex; the first 4 pages print at "legal" speed. The remainder of the pages in that job print at the speeds shown. This speed change occurs at each new job. Note:(3) The first 15 envelopes run at multipurpose feeder's full rated engine speed; subsequent pages run at the speed shown. Note:(4) Paper labels supported for occasional use only. Note:(1) Paper labels supported for occasional use only. First copy time from standby(1) - mono            <9.0 sec. First copy time from standby(1) - color          <11.5 sec. First copy time from power saver(1) - mono       <20.0 sec. First copy time from power saver(1) - color      <20.0 sec. Note:(1) All first copy times are measured for 4800 "Color Quality" simplex printing on letter sized paper. The test job consists of the a single page of simple text (approximately 20% coverage). The First Copy time is defined as the elapsed time from hitting enter on the PC keyboard to the page exiting to the output bin. All tests will pick paper from the default primary input tray and the page will exit into the default primary output bin. Times may be longer if an automatic calibration is required. The InfoPrint Color 1826 MFP printable area is limited to within 4.2 mm (0.167 in.) of top, bottom, left or right edges of the media. Any information placed outside this specified printable area will not print. The printer comes standard with one 250-sheet paper drawer and a manual slot. A 100-sheet output bin is standard. See table below for standard and maximum media capacities. 5.83 x 8.27 in. to 8.5 x 14 in. 3 x 5 in. to 8.5 x 14 in. 8.27 x 11 in. to 8.5 x 14 in. 98.4 x 190.5 mm/3.875x7.5 in. 98.4 x 225.4 mm/3.875x8.9 in. 104.8 x 241.3 mm/4.12x9.5 in. 3.87 x 6.38 in. to 6.93 x 9.84 in. Note:(1) When Universal is selected, the page is formatted for 215.9x355.6 mm (8.5x14 in.) unless the size is specified by the software application. Note:(2) Narrow media should be loaded with the length in the feed direction (portrait). Note:(3) When Other Envelope is selected, the page is formatted for 215.9x355.6 mm (8.5x14 in.) unless a size is specified by the software application. Note:(1) For 60 to 176 gsm paper, grain long fibers are recommended. Note:(2) Paper less than 75 gsm (20 lb) must be printed with Paper Type set to Light Paper. Note:(4) 100% cotton content maximum weight is 24 lb bond. Note:(5) 28 lb bond envelopes are limited to 25% cotton content. Note:(6) Duplex supports paper weights between 16-28 lbs (60-long grain bond). The duplex does not support cardstock, transparencies, envelopes, and labels. Note:(9) Paper 90 to 104.9 gsm (23.9 to 27.8 lb) must be printed with Paper Type set to Heavy Paper. Note:(10) Paper 105 to 176 gsm (27.9 to 47 lb) must be printed with Paper Type set to Cardstock. Note:(1) 20 lb xerographic paper at ambient environment. Note:(2) Capacity may vary and is subject to media specifications and printer operating environment. Note:(4) Capacity will vary depending on weight and type of media. Note:(1) Output Bin Near Full and Output Bin Full are not supported for narrow media. Colored papers must be able to withstand 200 deg C (392 deg F) fusing temperature. Preprinted forms and letterheads must be able to withstand 200 deg C (392 deg F) fusing temperature and should be selected using guidelines found in the printer User's Guide. The chemical process used in preprinting may render some papers unsuitable for use with this printer. As an environmentally conscious company, InfoPrint Solutions Company supports the use of recycled office paper produced specifically for use in laser (electrophotographic) printers. The following property guidelines apply to recycled paper. Recycled paper, paper of lower weight (<60 gm2 / 16 lb bond) and/or lower caliper (<3.8 mils / 0.1 mm), and paper that is cut grain-short for portrait (or short-edge) fed printers may have lower bending resistance than is required for reliable paper feeding. Before using these types of paper for laser (electrophotographic) printing, consult your paper supplier. Remember that these are general guidelines only and that paper meeting these guidelines may still cause paper feeding problems. Preprinted papers that require a registration (the precise print location on the page) greater than +/-2.3 mm (+/-0.9 in. ), such as optical character recognition (OCR) forms. In some cases, registration can be adjusted with a software application to successfully print on these forms. Recycled papers that fail EN12281:2002 (European). For best results, printing on new 90 gsm (24 lb.) sulfite or 25% cotton bond envelopes is recommended. During the life of the printer, components are subject to wear based on usage. Printers continuously operating at or near the maximum duty cycle may require service for replacement of these components to ensure high quality printing and good performance throughout the life of the printer. Replacement is recommended every 30,000 pages for the Imaging Unit. The printer performs an automatic calibration under the following conditions: 1. at power on, 2. after 8 hours of Power Saver, 3. every 500 pages, or 4. after changing a print cartridge. A manual calibration can be initiated from the Op Panel. Applies different color correction to each object on the printed page depending upon the type of object and how the color for each object is specified. No color correction is implemented. Allows users to customize color correction output from Drivers or the Op Panel. Note:(2) US CMYK is default for low volt printers, Euro CMYK is default for high volt printers. Applies a color correction algorithm that produces brighter, more saturated colors. Applies color correction to produce output that approximates the colors displayed on a computer monitor. Increased color saturation for the sRGB Display color correction. Applies color conversion table to produce output that approximates the colors displayed on a computer monitor using only black toner for neutral gray colors. Applies color correction to approximate SWOP color output. Increased color saturation for the US CMYK color correction. InfoPrint Color 1826 MFP offers a Color Balance Control. It is a color correction option that allows the user to increase or decrease the amount of toner going to the page individually for the cyan, magenta, yellow and black color planes. The scale for the adjustments is +5 to -5. Color balance is available in the default host based PS and PCL drivers. InfoPrint Color 1826 MFP will offer a ColorSaver Mode that allows end users to print images and graphics lighter. Text will print at Toner Darkness "4", while images and graphics print at Toner Darkness "1". The ColorSaver Mode is located on the Op panel and may be selected from the PostScript or PCL Drivers. The ColorSaver Mode is also available in the default host based and XPS drivers. The Coverage Estimator is designed to give the user an approximation of percent coverage per color when printing a composite color document. The estimation of coverage can be used to calculate an approximate cost of any given document if yield and coverage are assumed to be linear and inversely related. This tool should allow customers to discover for themselves that printing color documents on color laser printers is frequently an economical way to create these documents. Furthermore, they can discover that many black and white documents can be improved for a nominal increase in cost. The Coverage Estimator allows end users to estimate the percent coverage of cyan, magenta, yellow and black for a print job. The estimates will be printed on a report page following the job. The Coverage Estimator is available from the Op Panel under the utility menu. The Coverage Estimator is intended to only estimate the coverage on a given page. For all toner colors that are used, the minimum percentage reported will be two percent. Reported values may vary from printer to printer. The accuracy of the estimates may be affected by the fullness of the print cartridges, environmental conditions, media type, application, application settings, driver, driver settings, and the content of the page. InfoPrint Solutions Company makes no claim as to the accuracy of the estimated percents. The printer offers this feature via the Op Panel or Host Based drivers. In this feature, setting this option to TRUE has the effect of more faithfully representing fine detail in jobs, such as fine lines in CAD drawings. The default is false. Enhance Fine Lines is available in the default host based PS, PCL, and XPS drivers. Block Junk Fax Function = Yes. Blocks junk faxes based on caller ID and remote station ID. Note:Each number in a group fax is a location. Fax from PC is supported using Postscript driver for both local and network attach modes. The following table summarizes performance numbers for the InfoPrint Color 1826 MFP. ADF(1)     Letter  StandBy/Ready      25 SPM Max. ADF(1)     A4      StandBy/Ready      23 SPM Max. Flatbed    Letter  StandBy/Ready      25 SPM Max. Flatbed    A4      StandBy/Ready      23 SPM Max. Note:(1) Loading paper in the ADF or Flatbed or touching the M40 MFP Option display will activate warm-up of the MFP and could lower this time to first copy. Time to First Copy/or First Copu Out Time (TTFC or FCOT) - Regardless of using the Flatbed or the ADF this is the amount of time from pressing the Copy button until the preprinted copy sheet lands in the output bin. Copy Output Resolution is 600 X 600dpi. of V.8 and T.30 with annex F.
Left/Right buttons navigate within the menus. This interface located on the Operator Panel allows individuals to print supported files directly to the printer using an approved USB flash memory device. This interface is PictBridge certified. The InfoPrint Color 1826 MFP printer complies with the global safety standard for Information Technology Equipment, IEC 60950, and its country equivalents in the markets we serve. The following sections highlight the approvals and certifications that printer is expected to receive. Note:Other/Miscellaneous Other country approvals may be obtained. The InfoPrint Solutions Company Script Install utility provides a very powerful method to install or uninstall printer software in Windows NT 4.0, Windows 2000, Windows XP or Windows Server 2003 environments. Through the use of the Script Install utility, System Administrators can easily perform mass rollouts of IBM printers by creating custom scripts to perform local or remote printer software installations on end user workstations. When combined with the Driver Profiler utility, I/T shops can centrally create and deploy custom printing environments for each remote location. Together, these utilities drastically reduce the time required to install printer software in a distributed environment. The InfoPrint Solutions Company Printing Solution for Novell systems offers administrators more control over the printers. This all-inclusive package provides support for both NDPS and iPrint printing systems on NetWare 5.1, 6.0, 6.5 and NOES for NetWare servers. The package consists of Novell's NDPS gateway coupled with IBM's custom control snap-ins for both NetWare Administrator (NWAdmin) and iManager. By offering custom support for both NetWare Administrator and iManager management utilities, this offering allows administrators to take full control of IBM printers in a Novell printing environment. InfoPrint Color 1826 MFP printer drivers for Windows provide users with the most comprehensive set of printing features available. Offering an easy-to-use interface and time saving preset features, these drivers allow users to access popular printer features intuitively. Built on Microsoft technology, these drivers mix key InfoPrint Solutions Company printer capabilities with Microsoft's rendering engine to provide a solid, full-featured driver. InfoPrint Solutions Company drivers are available in HBP, PCL emulation, PostScript emulation, and XPS emulation versions. InfoPrint Solutions Company printer drivers reduce the complications of printing in UNIX and Linux environments. Built on the LPRng printing system, the InfoPrint Solutions Company printer drivers provide fully scriptable command-line options. When running in X-Windows mode, InfoPrint Solutions Company printer drivers make it easy to access many popular printer features without memorizing command line options through a GUI interface. InfoPrint Solutions Company offers Mac OS printing software (PPDs, PDEs, etc.) to provide a first rate printing experience in an Apple environment. These files allow Mac OS 9 and Mac OS X users access to advanced printing features included with this product. The Printer Status Utility complements the driver software by providing printer status feedback from a remote location. Another utility, Printer File Loader, allows download of any files to printers. Printer drivers are provided on the Drivers and Utilities CD that is packaged with the printer. See Publications section for details. InfoPrint Color 1826 MFP is compatible with applications running under the following operating systems for either local or network connections: For information about USB connections, see Local Connections. Note:(1) Download the latest printer drivers from InfoPrint Web Site. Note:(3) Printer Driver for Unix are shipped on the Drivers and Utilities CD. Note:(4) Printer driver support only. No support for IBM utilities. Driver must be installed using Windows Add Printer Wizard and is only supported for network printing.. Note:(5) Printer Drivers for Linux that are shipped on the Drivers and Utilities CD. Note:(7) InfoPrint may not offer printer drivers for these systems. Note:(8) Support for these operating systems only available from the InfoPrint Web Site. Note:(9) Citrix and MetaFrame are registered trademarks of Citrix Systems, Inc. MetaFrame XP is a trademark of Citrix Systems Inc. Note:(10) System driver support only; no custom driver support. Note:(1) Allow clearance above the printer for optional drawer. Note:(2) In some cases performance specifications (such as paper OCF, EP cartridge usage) are specified to be measured at an ambient condition. Note:(2) The power consumed is the maximum average observed during our testing at the prescribed test conditions per the applicable Product Safety standards. Your measurements and those made at other prescribed operating points (such as EPA testing) will vary considerably, although these should be the maximum observed in any realistic customer operating mode. Note:The numbers shown in the above are the actual power values for the product measured with the final level hardware tested using standard procedures. Note:Using a 220 V ac to 110 V ac power converter with the low voltage model is not recommended. Note:All models are ENERGY STAR compliant. Note:All models ship with Power Save Mode = On. Note:The default timeout to power saver is 60 minutes. All measurements were made in accordance with ISO 7779:1999 -- Acoustics: Measurement of airborne noise emitted by information technology and telecommunications and reported in conformance with ISO 9296:1988-04-15 -- Acoustics: Declared noise emission values of computer and business equipment. This will be available in the following languages: Arabic, English, Danish, Dutch, Finnish, French, German, Hebrew, Italian, Korean, Norwegian, Polish, Brazilian Portuguese, Portuguese, Romanian, Russian, Spanish, Swedish, Simplified Chinese, Traditional Chinese, and Turkish. These will be available in the following languages: Danish, Dutch, English, Finnish, French, German, Italian, Korean, Norwegian, Polish, Brazilian Portuguese, Russian, Spanish, Simplified Chinese, Traditional Chinese, Arabic, Hebrew, Romanian, Swedish, and Turkish. This will be available in the following languages: English, Danish, Dutch, Finnish, French, German, Italian, Norwegian, Polish, Brazilian Portuguese, Russian, Spanish, Swedish, Hungarian, Czech, Turkish, Simplified Chinese, Traditional Chinese, Korean, and Japanese. All printer features are customer installable. This additional drawer fits under the standard drawer and increases the printer's input capacity by 650 sheets. It includes a 550-sheet drawer and a 100-sheet multipurpose feeder. The InfoPrint Color 1826 MFP has one slot for memory DIMMs and one slot for flash memory cards. The following font cards plug into the flash memory slot. Only one flash memory card or one font card is supported. The optional DBCS (Double-Byte Character Set) Font Cards provide printer resident fonts for use printing Simplified Chinese, Traditional Chinese, Japanese and Korean. The Chinese and Japanese font cards also contain a display font used for displaying Chinese and Japanese on some MFP devices. The DBCS Font Cards are suitable for use in a range of InfoPrint Solutions Company printers and MFPs. Fonts contained in these cards emulate those provided in Microsoft Windows. The use of printer-resident fonts in the card improves performance and minimizes network traffic since less data is downloaded to the printer. Each font card supports encodings appropriate for the language, including Adobe CID encodings. Simplified Chinese for China with two scalable print fonts and one display font. Traditional Chinese for Taiwan with two scalable print fonts and one display font. The fonts used with the PCL emulation are compatible with the fonts in the HP LaserJet Language DIMM Memory options for Traditional Chinese and Simplified Chinese, which are compatible with the HP LaserJet 4050, 4000, 4000 N, 4000 T and 4000 JN. These fonts are available in the PostScript emulation and are compatible with Adobe PostScript 3. The Japanese Font Card contains two scalable print fonts for use with PCL and PostScript emulation and one display font. The Postscript fonts are compatible with Adobe PostScript 3 and emulate Adobe PostScript fonts such as those in the Ricoh NX750. The fonts used with the PCL emulation are compatible with the fonts in the HP LaserJet Language DIMM Memory options for Japanese, which are compatible with the HP LaserJet 4050, 4000, 4000 N, 4000 T and 4000 JN. The Korean Font Card contains eight scalable print fonts for use with PCL and PostScript emulation and is compatible with Adobe PostScript 3. The fonts used with the PCL emulation are compatible with the fonts in the HP LaserJet Language DIMM Memory options for Korean, which are compatible with the HP LaserJet 4050, 4000, 4000 N, 4000 T and 4000 JN. This 2 meter USB cable allows the user to connect one laser printer to one host machine (or external print server). The cable provides a USB "A" connector for the host machine and a USB "B" connector for the printer. The InfoPrint Color 1826 MFP supports USB 2.0 high speed. These external features plug into a USB port on the printer. 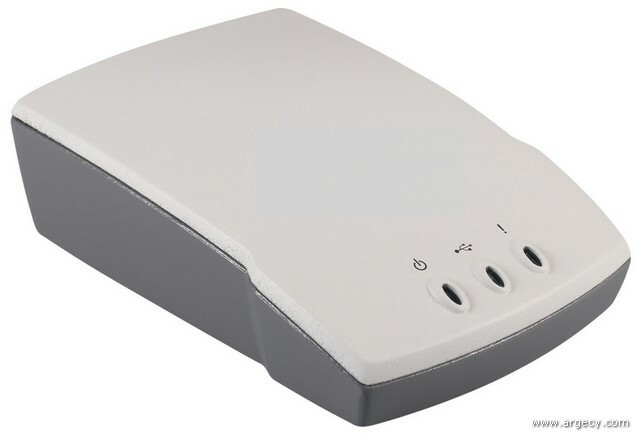 This external feature allows the printer to be connected directly to a wireless LAN using the IEEE 802.11g wireless standard. This standard operates at speeds of up to 54 megabits per second (Mbps). The range of this wireless adapter depends on the environment, whether used indoors or outdoors and building contruction. Typical indoor ranges are 20-50 meters and outdoor ranges are 100-200 meters. Performance will degrade with distance. The wireless LAN feature is compliant with any WiFi-compliant device. InfoPrint is a trademark of InfoPrint Solutions Company LLC in the United States, other countries, or both. Windows is a trademark of Microsoft Corporation. UNIX is a registered trademark in the United States and other countries licensed exclusively through X/Open Company Limited. - IBM Corporation 2008.